For a long time there has been a stigma attached to motorsailers: They&apos;re neither good motoryachts nor good sailboats. But in a world where "going green" has become a chief concern and "the rising price of fuel" has become a clich, many manufacturers of both boats and engines are looking toward hybrid machines. And although most motoryacht builders are still staying clear of sail power in favor of exploring electric or hydrogen hybrid options, a few companies have either built or are currently building passage-making motoryachts that use sails as an auxiliary source of propulsion. The question, of course, is how to create a boat that blends the comfort and speed of a motor vessel with the efficiency of sail power while minimizing the drawbacks that a sailing rig imposes on a motoryacht. Back in the &apos;70&apos;s, &apos;80&apos;s, and &apos;90&apos;s, Jim Leishman, Nordhavn&apos;s co-founder and vice president of Pacific Asian Enterprises (PAE), along with his brother and PAE chief designer Jeff Leishman and president Dan Streech, designed and built more than 200 Mason sailboats intended for world cruising. According to Jim, the majority of owners were retirees who dreamt of global travel. 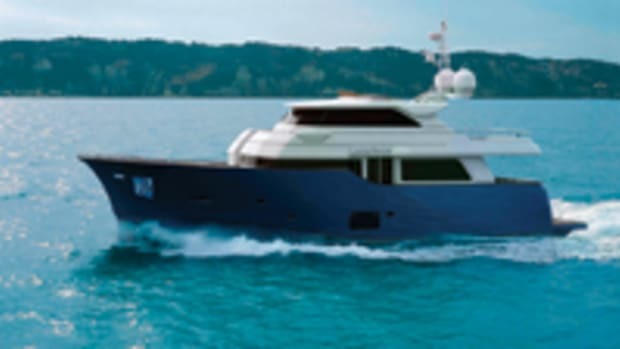 But when the company conducted research, it found that only about three out of ten Mason owners actually took the boat on long-distance cruises. The sailing aspect of the boat intimidated many of the retirees, who were simply not up for the physical demands of long-distance sailing and manhandling a sailing rig. "They just wanted to go," says Jim. 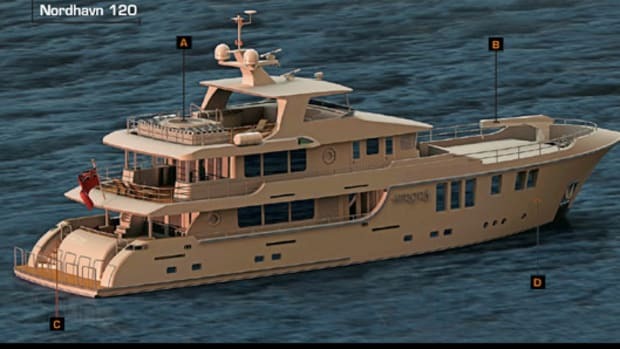 The new Nordhavn 56 MS should launch this summer. 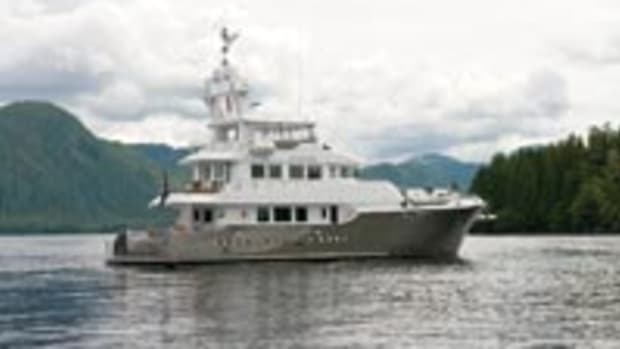 PAE launched Nordhavn in 1989, creating a motoryacht brand that specializes in oceangoing trawler yachts. According to Nordhavn&apos;s experience, the success rate for owners who bought the boat in order to undertake long-distance journeys is near 100 percent. So given that, what would inspire Nordhavn to cast a second glance back at a sailing rig? Well, it started in January 2007 when Jim completed a trip around Cape Horn with a Nordhavn 46 and considered a trip to Antarctica. But the lack of fueling stations taxed the 46&apos;s 3,000-mile range. This inspired Jim to revisit sail power, a propulsion method that could make such distances practical. 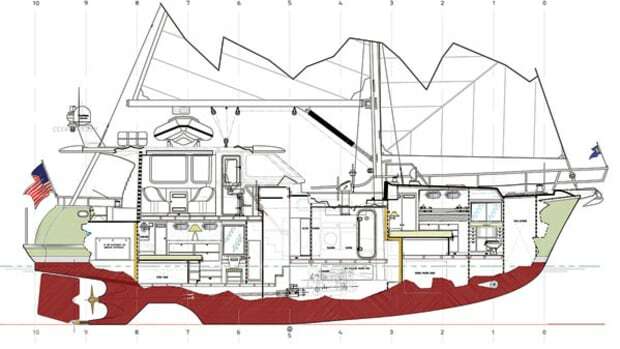 The idea gave birth to the Nordhavn 56 MS, set to launch later this summer. Nordhavn expects the 173-hp Lugger L1066T.2 diesel engine to give her a range of 3,800 NM at 7 knots on her total fuel capacity of 750 gallons in three tanks. 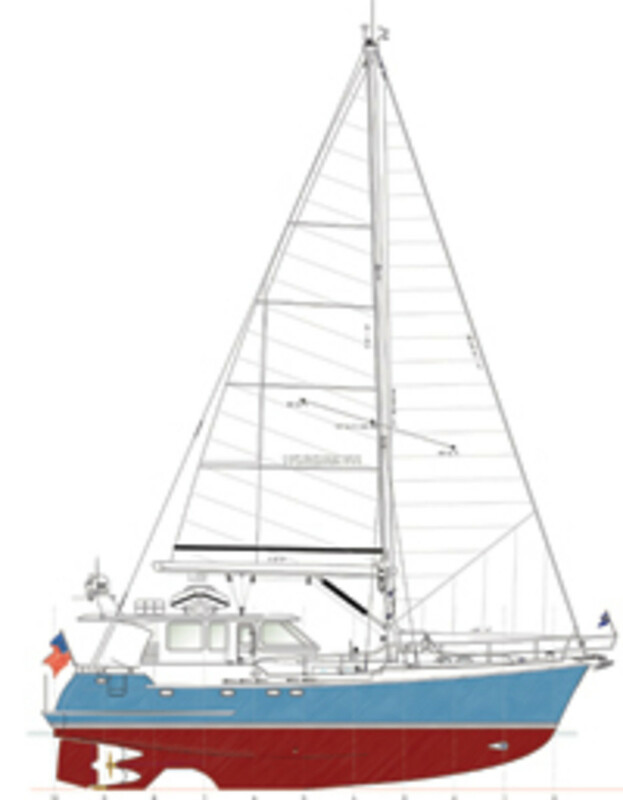 The addition of a sloop rig means her range should dramatically increase, the exact amount depending upon wind and sea conditions. But good efficiency doesn&apos;t necessarily mean good seakeeping, and Nordhavn needed a boat that could handle the challenging climes of the Southern Ocean. 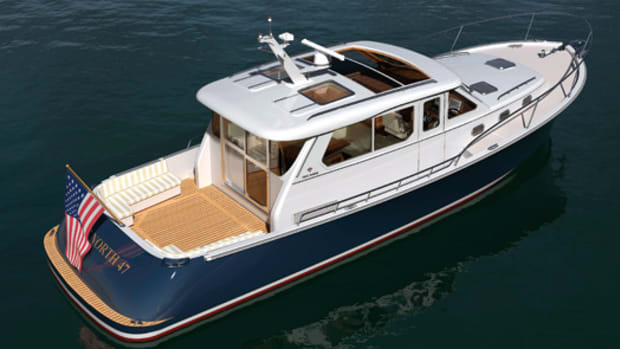 In a typical Nordhavn motoryacht, about ten percent of the vessel&apos;s total weight is ballast; in the 56 MS it&apos;ll be 25 percent, or 17,500 pounds. Her full-displacement hull will work like that of any sailing vessel, countering the force of the sails to improve stability and acting in synergy with the sails to create the lift needed to move the boat upwind. But both the ballast and the sailing rig will add to the overall weight of the vessel. That means more for the Lugger to push, but not as much as it would seem. Since the sails will be able to act as an emergency propulsion system if the main engine were to quit—say, due to contaminated fuel—there will be no need for a secondary "get-home" engine with its separate fuel system, which is standard on all Nordhavns. In addition, the sails and keel nix the need for hefty stabilizers, again reducing weight. 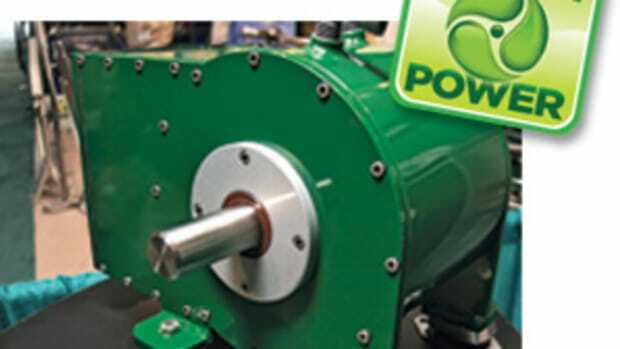 Removing roll stabilizers also means a reduction in drag, which in turn increases both speed and fuel effciency. And the removal of two onboard systems, the stabilizers and the get-home engine, means less maintenance overall. How long will it take the 56 to make that round-the-world voyage? The company predicts a top speed of 9 1/2 knots under engine alone. When the wind is up, the owner will be able to hoist sail and throttle down the engine and still maintain a comfortable cruising speed of 7 knots. To fine-tune the boat&apos;s under-power efficiency, he or she will also be able to dial in the Hundested variable-pitch propeller to increase the exhaust temperature and fully load the engine. A fully loaded engine helps maximize fuel economy. 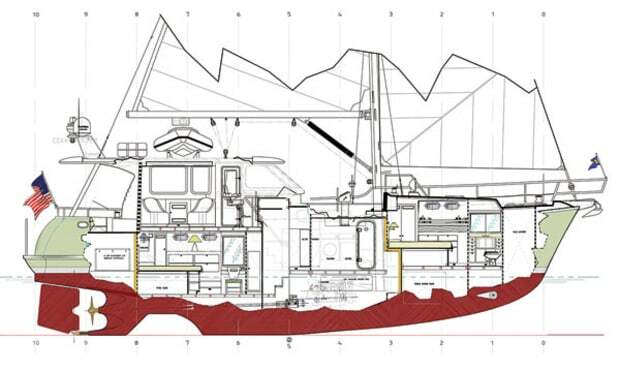 But on the Nordhavn 56, the sails are meant to supplement the diesel, not replace it. This is so especially upwind, where the engine speed may increase the angle of the apparent wind (apparent wind is an average of true wind and the wind you generate with your boat&apos;s movement, and basically it&apos;s the apparent wind that determines how close you can sail to the true wind), forcing the owner to tighten the sails earlier than he or she would on a typical sailboat. But just flattening your sails provides some relief for fuel consumption and boosts speed. Jim doesn&apos;t believe owners will be intimidated by the intricacies of the sailing rig like some were on the Masons, since the system will be much simpler: A roller-furling jib and in-boom roller-furling main will be trimmed with hydraulic winches controlled from the wheelhouse. Push-button roller-furling means that all you have to do is depress a button, and the sails raise or lower (or roll out, as the case may be). "This is not going to be a high-performance sailboat," Jim admits, "but [she] will be a wonderful motoring boat." Mit-sea-Ah sails along with her spinnaker out. The 56 MS looks like a sound hybrid-powered solution for those content with a laidback pace, but is there a way to make a motorsailer that gets a really rousing turn of speed? The 156-foot, semidisplacement Mit-sea-Ah launched back in 2005 by Pendennis Shipyard may hold some of the answers. 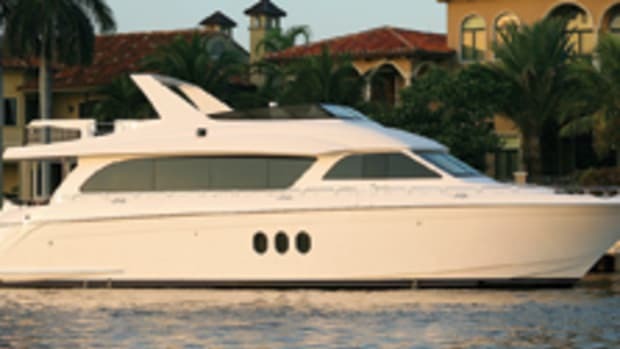 Her owners had previously enjoyed running a motoryacht but were drawn to the motorsailer design primarily because of the extended range they could enjoy without having to return dockside to bunker. The adventurous mystique of sailing vessels also lured them, provided that they were able to keep both the top-end velocity and the luxurious accommodations of their previous power-only yacht. 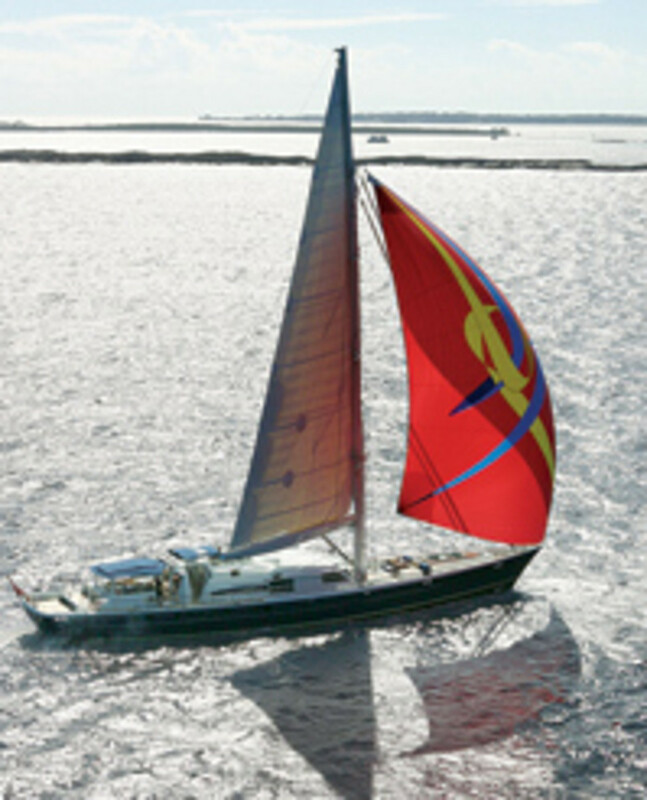 The vessel&apos;s purported 25-knot speed under engine or sail is a direct result of her semidisplacement hull. Yet designing a semidisplacement yacht with a sailing rig on this scale took some ingenuity. One of the most important features is a centerboard with a bulb, the first of its kind. When the bulb is not providing a counterbalance to the wind force on the sails, the entire centerboard lifts into its specially shaped trunk (think of a flip-up keel), ridding the vessel of unwanted drag while the twin 3,500-hp Paxman diesel powerplants account for all of the propulsion. To aid stability there&apos;s another important retractable component. 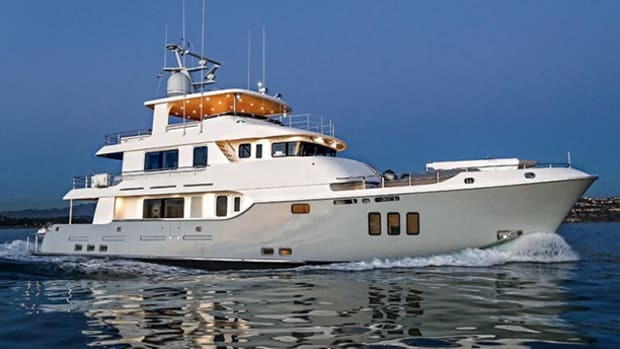 "[The owners] wanted bridge clearance for certain ports of call," explains designer Richard Liebowitz of Liebowitz & Pritchard, whose team did the styling, "so the masthead retracts ten meters [32"8&apos;]." Another big benefit of this is less weight aloft and thereby more stability when motoring sans sails. David Pedrick, the chief naval architect, added another feature that increases stability. Dual planing flaps underneath—imagine enormous trim tabs—that are attached to quick-acting rams help stabilize the vessel while under either regime. As I discussed the implications of Mit-sea-Ah&apos;s attributes on the rest of the motorsailer market with Liebowitz, he seemed to wince a little, affected by the pejorative connotations of the term motorsailer: "It&apos;s really more of a sailing yacht that performs equally well under motor power." Which raises the question of how to define a modern motorsailer. As long as she retains the luxuries and performance aspects of a motoryacht, could, say, a planing multihull sailboat with big engines be considered a motorsailer? I&apos;ll leave that for the naval architects and marketing departments to decide. On any account, the performance of motorsailers has improved dramatically in recent years thanks to some smart design innovations. For those who want a long-distance cruising yacht, this hybrid source of power is promising. Even as motorsailers try to overcome their past stigma, they still enjoy a strong following. And although I hate to end on a clich, the desire for them may be rising like the price of petroleum.